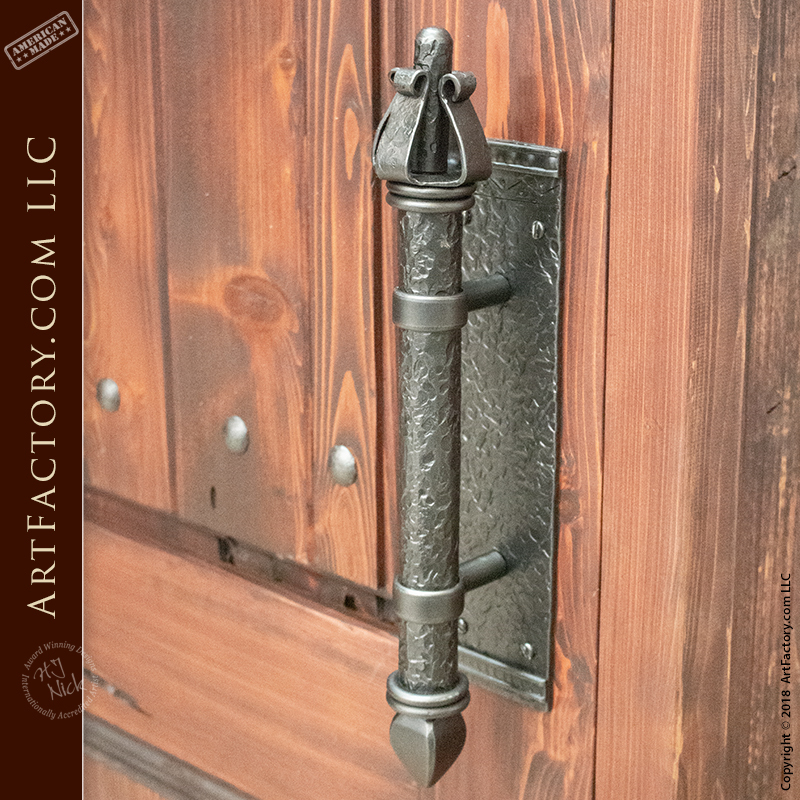 At ArtFactory.com, our medieval dungeon door handle, and all of our custom door handles and backplates are hand hammered by master blacksmiths. Each is designed specifically for you, and custom made to order. That means we have no limitations on size, style, or finish color. Additionally, each product is certified as meeting world class fine art specifications. Anvil hammered and hand patina finished, we guarantee our custom hardware to never erode, and will stay beautiful for generations with little or no maintenance. Your guests will marvel at the charm of your custom, hand hammered medieval dungeon door handle with matching hand hammered texture, backplate. Any of our handles can be made compatible with the the lock of your choice, or without as shown. This hand forged, medieval dungeon door handle set features a matching, hand hammered texture on all pieces. This texture is not stamped, cast, machine made. These pieces are each a genuine, one-of-a-kind works of fine art. They are built the old fashioned way, with fire, hammer, and anvil, and will never be exactly reproduced. When you purchase our medieval door hardware products, they are made using the same techniques and materials that would have been used in the Middle Ages. It is our believe that historically correct methods and materials are especially relevant when creating a fine art quality product. Don't settle for low quality reproductions when you can own a genuine, handmade piece. Our medieval inspired door hardward products are handmade by master blacksmiths using the same, old world techniques and materials that were used to build the originals. We build all of our medieval dungeon door handle, and all custom door hardware products from pure wrought iron, because unlike other metals, wrought iron doesn't corrode with exposure to the elements. Furthermore, all of our genuine wrought iron hardware is finished with a hand applied, iron oxide, advance patina. This patina is heat applied at over 1000 degrees Fahrenheit so that it will infuse to the metal. What this means is a finish that will stand the test of time and look better with age. Because our finishes actually become part of the metal, they will never crack, flake, or fade like powders and paints. Every product from ArtFactory.com is designed by, and built under the supervision of award winning artist H.J. Nick. Nothing leaves our facility without the signature of H.J. Nick. This coveted signature is only applied to each creation after all inspections have met our fine art world class standards. The signature is sometimes also dated with the first design conception date. This certification and signature ensures you of a product that is of investment quality, and will have future appreciable value in antiquity. At ArtFactory.com, our combination of fine grade materials and master hand craftsmanship allow us to offer a quality of product that is unmatched anywhere at any price. In fact, we are so confident in our products that we guarantee everything forever. Call us today at 1-800-292-0008 for pricing on our medieval dungeon door handle, or any of our fine art quality custom hardware products.